Fox News primary: GOP candidates appear on Fox News to try to get into the Fox News debate. 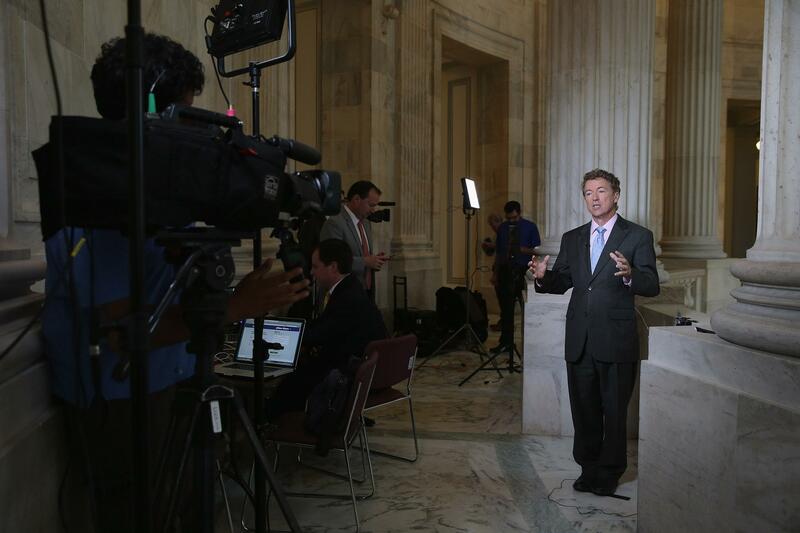 Republican Sen. Rand Paul of Kentucky does a live interview with Fox News from Capitol Hill on June 1, 2015. With the first Republican presidential debate only two months away, conservative contenders and pretenders are scrambling to claw their way onto Fox News’ 10-person debate stage. The cable news network, which will host the event in Cleveland, has said it will send invites two days before the Aug. 6 event only to those candidates who are polling the best in the five most recent national polls. Given that, there’s no time like the present for those at risk of being snubbed to make sure GOP voters know their names. One of the best ways to do that? Conveniently enough, with an appearance on Fox News. For a cash-strapped candidate, sitting down for an interview with the conservative cable network is among the cheapest and most effective ways to reach those voters who will decide your fate. That’s not to suggest these numbers are the result of some sort of master plan from the Fox News Powers That Be. Some candidates, like Bush, have largely avoided sit-down interviews to date, while others, like Paul, have locked down screen-time across the cable spectrum by driving the national conversation. A few Fox News hits, though, can only do so much. Fiorina, for instance, was on the cable channel for a total of 36 minutes last month, spread out over five separate appearances—yet she still remains on the outside looking in with somewhere around 1 percent support in most national surveys. Fox News Ends the GOP’s Debate Debacle—But Did It Just Create a Trump-Sized Problem?